Most of you will know as much as I love reading I am not a fan of books by celebrities I have never read a book by a celebrity which I have enjoyed. 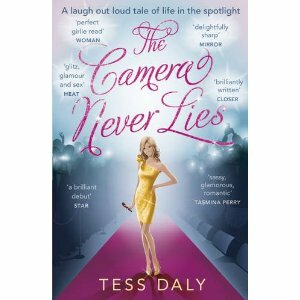 When I read the synopsis for The Camera Never Lies it instantly sounded like my kind of read and I loved the front cover of the book, but then I see the author way Tess Daly. I love Tess Daly in her presenting jobs but I wasn’t holding out much hope for this book. Britt Baxter has just lost what she thought was the biggest job opportunity of her life when she refuses to sleep with the boss to seal the deal. When she is told from her management that she is too old now for another great modelling job to come her way Britt finds she is desperate for work to pay the bills. Whilst trying her hand at waitressing Britt is offered a great job opportunity as a presenter on breakfast tv. Things start off all rosy and Britt is quickly accepted by the views and the press, but it isn’t long before things come crumbling down on Britt when she finds details about her personal life in the papers. I was very surprised how much I enjoyed this book baring in mind if I am honest I didn’t start reading this book with an open mind, I had already made my mind up that this book was going to be like any other books by celebrity authors so Tess Daly had a real challenge in changing my stubborn mind! It is quite clear through the book that the author has used some of her past experiences and insight into both the modelling and presenting parts of the book which gave the book a more realistic feel to it. Britt found herself in some humorous situations which for some people they may find borderline crude but I think anyone reading light hearted chick lit will take all of these parts on the chin. I found the book really easy to get into and was an enjoyable and entertaining light read. I was pleasantly surprised that Tess Daly seems to be a very talented author. I did find the book predictable but this didn’t put me off of the book. I would have loved to have had Alex who was Britt’s boyfriend, involved in the story a bit more I found I enjoyed the book more when he was in it. I will definitely pick up any future books by Tess Daly and I would recommend this one if you are looking for a quick and easy read with all the glitz and scandals! Check Back this evening to be in with a chance of winning your own copy of The Camera Never Lies!